I’m rerunning a post from April of 2014. 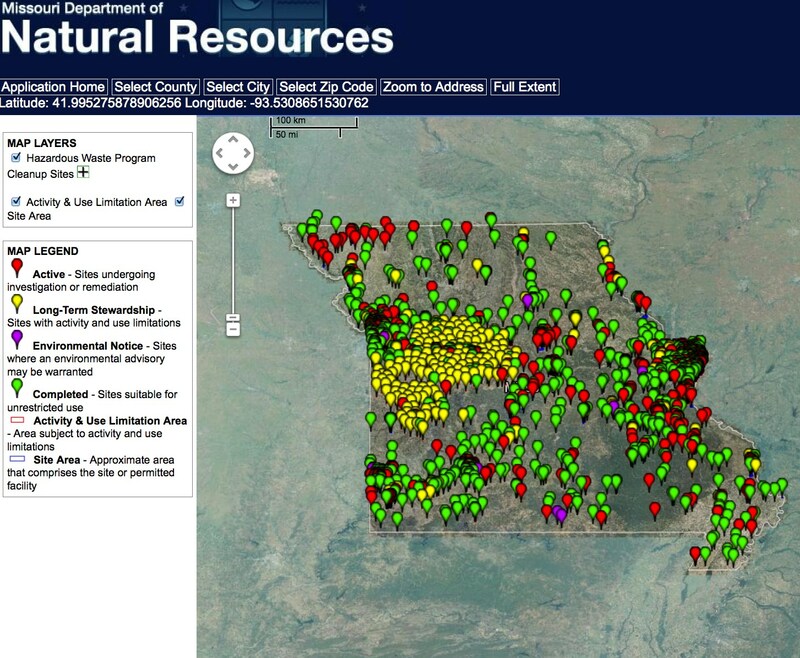 The mapping service it describes continues to be available on the website of the Missouri Department of Natural Resources. Interactive Map of Hazardous Waste Sites (originally published 4/2/2014). A new mapping service published by the Missouri Department of Natural Resources offers residents the opportunity to map the location of hazardous substance sites across the state. The Missouri Hazardous Substance Site Locator can give you a map to view in your web browser, a KMZ file to use with Google Earth, or data to import into a GIS program. You can use the map to zoom in and explore areas in more detail. If you click on one of the markers, a box pops up giving the name and address of the site and providing a link you can click for more information. 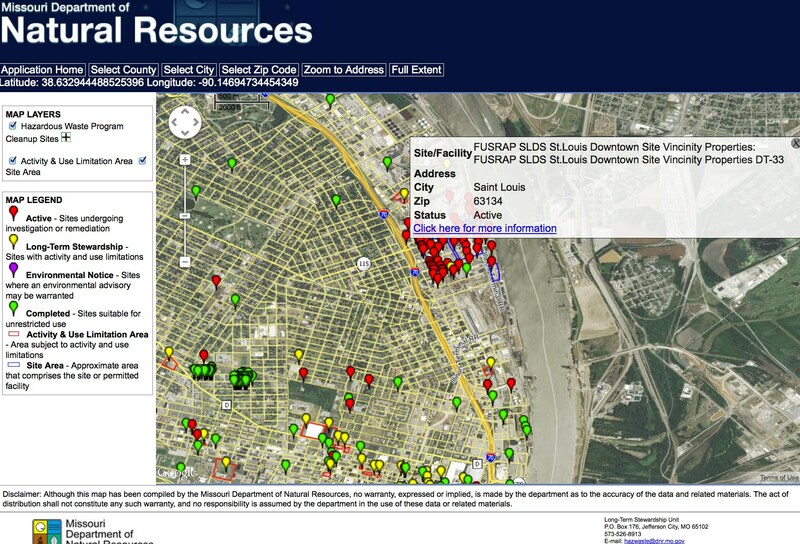 The second map at right shows a region of North St. Louis along the Mississippi River and the identifying information for one of the sites, the FUSRAP SLDS site. Clicking on the link for more information opens a Site Summary page that describes the site in more detail. The radioactive waste in the West Lake Landfill in Bridgeton has been in the news a great deal recently. It turns out that it originated from uranium processing at the FUSRAP SLDS site in the 1940s. The site is being investigated and cleaned by the United States Army Corps of Engineers Formerly Utilized Sites Remedial Action Program (FUSRAP). As you can see from the first map above, the locator program identifies hundreds of sites across the state, of many different types. Some, like the FUSRAP SLDS site above, represent relatively larger public health concerns. Others represent lesser concerns, such as buildings from which lead or asbestos have been removed. Many of the sites have been identified for long-term stewardship. Residents should be able to use the program to explore hazardous waste sites in their community. Missouri Hazardous Substance Site Locator, Missouri Department of Natural Resources, https://www.dnr.mo.gov/molts/gov. By mogreenstats in Land, Pollution - Land on 2016/03/17 .